The entire CYPSY24 Conference will be held at Norfolk State University, located in Norfolk, Virginia, USA. The organizing committee encourages you to book a room before March 31st, 2019 to benefit from the conference special rate, and because this area is a summertime tourist destination and hotels in both downtown Norfolk and the Virginia Beach oceanfront (20 minute drive) fill up quickly for the end of June. Lodging is conveniently located in the Downtown area of Norfolk, just minutes away from the campus by public transit or taxi / Uber. 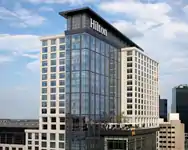 The conference hotel is the Hilton Main in Downtown Norfolk, which is only a few short minutes on the light rail from the campus. Room rates of $175 will be available for Monday June 24 and Tuesday June 25, as well as a limited number of rooms for Wednesday June 26 (first come, first served basis). Reservations with the conference rate can be made here. There are several other hotels in the downtown Norfolk area and surrounding Norfolk and Virginia Beach areas should rooms at the Main sell out or if you prefer a budget hotel. Keep in mind, June and July is peak tourist season in this part of Virginia! The downtown area is serviced by both bus and light rail, and we recommend using The Tide light rail for fast, convenient, and inexpensive service.Train tickets are purchased from machines at the station. There are no attendants at the stations, so checking the website ahead of time is recommended if you have any concerns. For hotels outside of the downtown area, there may be city buses available that run throughout the region, but they may not be easily accessible to get to the campus. There is a Tide station within a 5 minute walk from the hotel (MacArthur Square Station) and a stop directly adjacent to the campus (NSU Station), which is a little over a 5 minute walk to the area of campus where the conference will be held. The hotel and campus are three stations apart (about 10 minutes), making for a short and easy morning travel to the conference. Door to door, the commute is about 1.5 miles (about 2.4 km). The light rail schedule can be found here. CYPSY24 will be held at Norfolk State University, located in Norfolk, Virginia, USA. The university is located at the south-eastern portion of Virginia, close to the North Carolina border. Norfolk is approximately 200 miles (322 km) from Washington D.C., which is less than 1 hour by plane, between 3 and 4 hours by car depending on traffic, and about 5 hours by train (Amtrak). Norfolk International Airport is the closest option, but you will likely need a connecting flight from a larger travel hub, such as NY/NJ, DC, Raleigh, or Atlanta.